Pigeon outfitted with miniature camera. Before there were drones, before airplanes and helicopters, early aerial photographers flew in hot air balloons to document the world from a bird’s eye view. At the turn of the last century, one man took the phrase literarily, strapping cameras to homing pigeons and gaining international notoriety. German apothecary Julius Neubronner regularly used pigeons to deliver prescriptions to his patients. In 1907, he noticed that one of his pigeons had stayed away for a more than month before returning to him. To track its travels, he strapped a small, timed camera to the pigeon. Pleased with the resulting photographs, he ordered a larger camera and made bigger pictures. Photo from a pigeon camera. The next year, Neubronner was awarded a patent for his “Method of and Means for Taking Photographs of Landscapes from Above,” a miniature pigeon camera activated by a timing mechanism. 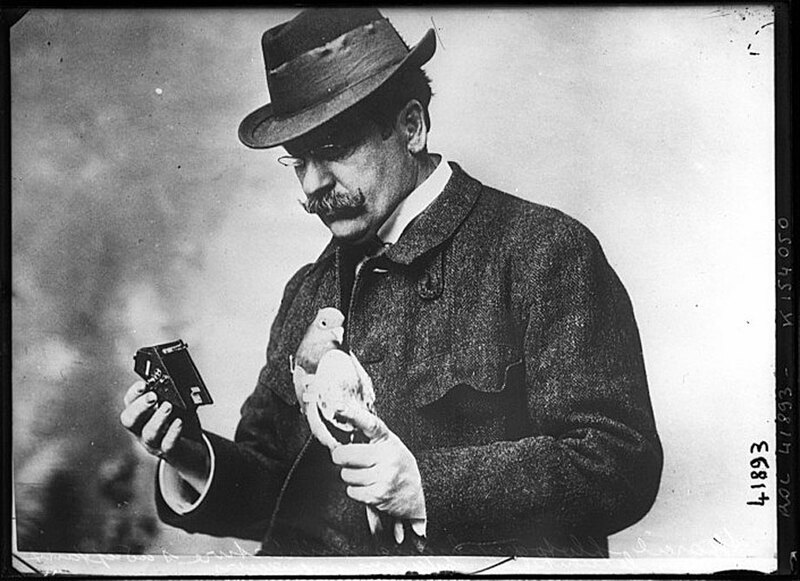 Carrying his pigeons to a location approximately 60 miles from his home, Neubronner outfitted the birds with the cameras before releasing them into the air. The cameras weighed around 75 grams and were fitted to the birds using a harness with a metal breastplate. Once the birds were released, the photographic exposure was made about 30 seconds later on a time delay controlled by a pneumatic system. Eager to be relieved of their burden, the pigeons flew home on a direct route at a height of 165 to 330 feet. Neubronner presented his miniature cameras and the feathered friends that carried them at international expositions in Dresden, Frankfurt, and Paris from 1909 to 1911. Travelling to the expositions, Neubronner constructed a mobile dovecote and darkroom. In Dresden, spectators watched the arrival of the pigeons, and the photographs they brought back were turned into postcards which become quite popular. During World War I, the German military took notice of Neubronner’s invention and attempted to use pigeon photography for air surveillance. Although battlefield tests provided encouraging results, Neubronner abandoned the project after the war when military and commercial interest waned. However, in the 1930s, Christian Adrian Michel, a Swiss clockmaker, further developed Neubronner’s invention for the Swiss Army carrier pigeon service. 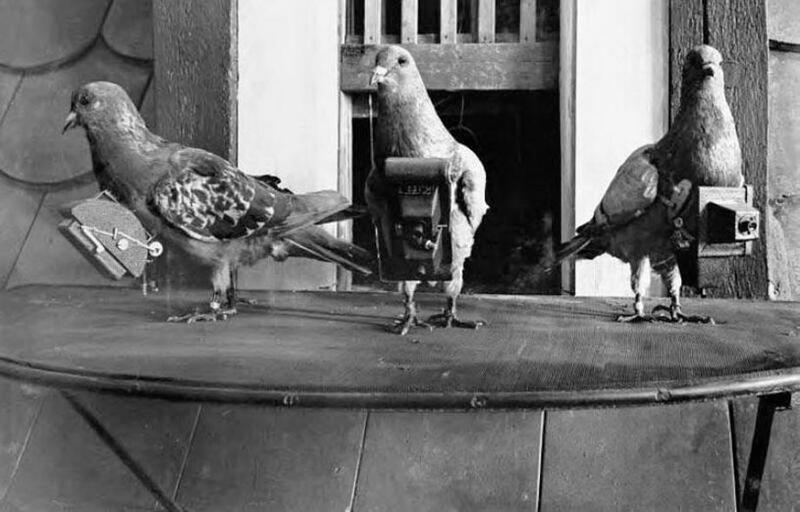 Aerial pigeons were used as late as World War II and the CIA produced a battery-powered camera for pigeons as an espionage tool, the details of the use remain classified to this day.